First, a caveat: Anyone expecting the home of supermodel Gisele Bündchen and New England Patriots quarterback Tom Brady to be a lavish pleasure dome replete with sultry sirens and gridiron gods cavorting around the pool is in for a serious letdown. Likewise, those who imagine a sprawling palace staffed with a battalion of liveried footmen proffering protein shakes on silver trays have also missed the mark. The reality of Bündchen and Brady’s life in Los Angeles’s Brentwood neighborhood is far more—dare we say it?—normal. The couple’s L.A. story began roughly six years ago, when Bündchen and Brady started making regular excursions to the sunny shores of Southern California during the NFL off-season. On one of those trips, prior to their marriage in 2009, they discovered an open lot with stunning views of the Pacific Ocean near the house they were renting. They immediately knew the patch of land would one day be home. 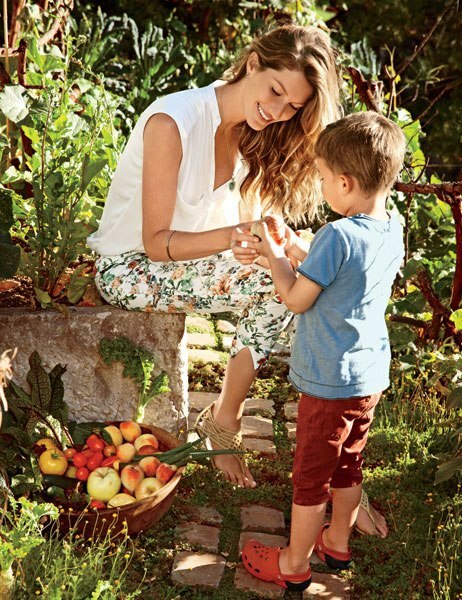 For Bündchen and Brady living well also means Living responsibly . Bündchen is a global ambassador for the United Nations Environment Programme, and the couple is acutely aware of issues related to the conservation of natural resources. One of their primary imperatives when building their home was to use as many recycled components as possible and to implement energy and water systems that would ameliorate the family’s impact on the land. In addition to composting, gray-water technology for irrigation, and environmentally friendly construction materials, the pair installed two substantial arrays of photovoltaic solar panels (one next to the garden, the other on the roof of the house) that would meet all of the property’s electricity needs. “From the beginning we asked everyone involved in the design and construction, ‘How can we make it as sustainable as possible?’” Bündchen says. 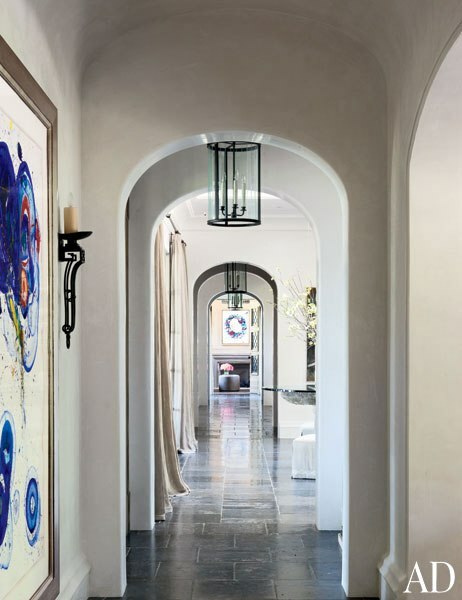 Incorporating those priorities into the design plan, Landry conceived an elegant interpretation of old-world European architecture—think French château via the Pacific Coast Highway—deftly attuned to the needs of contemporary life. The six-bedroom, nearly 14,000-square-foot house is constructed of different types of limestone, all acid-washed for patina and texture, with a traditional mansard roof of Vermont gray slate with zinc gutters and flashing. A winding driveway leads over a pond to a motor court paved in reclaimed cobblestones and then to a stone bridge spanning a koi-stocked moat that’s picturesque but not pompous. 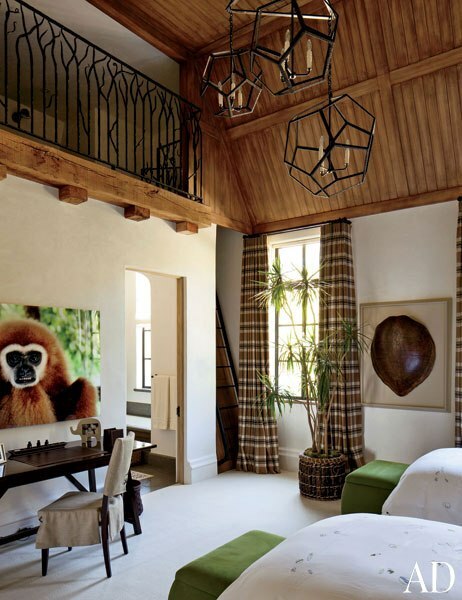 When it came to the interiors, Behnke punched up the restrained, sophisticated atmosphere with eye-catching light fixtures that include a confection of dripping silver mesh in the entry, gilded sconces by Hervé Van der Straeten in the great room, and an antique crystal chandelier in Bündchen’s dressing room that the model and designer purchased together in Paris. The color scheme throughout, playing off the building materials, is decidedly neutral, with occasional accents of green and blue. And the furnishings are unpretentious pieces made with fine natural materials such as Belgian linen, old leather, silk, and velvet. Part of that quest entailed the use of reclaimed ceiling beams and floorboards, salvaged ceramic tile, brick, and bluestone, and antique wood doors and marble fireplace surrounds. For Brady and Bündchen these were aesthetic choices that aligned with their commitment to reuse. Much of the repurposed material was supplied by Belgian dealer Koen Van Loo, a friend of the couple’s who sells vintage architectural details and building components.